With each powerful contraction, the human heart forces a strong wave of blood into the arteries. The blood presses against the vessel walls, which stretch and flex against the force, smoothing out the flow and moving it along. Many Americans believe that eating too much cholesterol leads to plaque buildup in the artery walls, blocking that flow and increasing the risk of heart attack and stroke. Unfortunately, this is untrue. Only one-half of all heart attack and stroke victims have elevated cholesterol levels,1 as there are many other factors that contribute to the development of cardiovascular disease (CVD). The good news is a nutritious diet can help maintain a clear, flexible, healthy circulatory system. Physicians have long been aware that arteries thicken and harden as we age as a result of plaque buildup. Traditionally, this process, called atherosclerosis, was treated by placing stents in blocked arteries to hold them open, removing the narrowed sections through bypass surgery, or using statins to lower LDL cholesterol to slow plaque buildup. According to Becker, physicians used to think that plaque built up over a lifetime like rings on a tree. They now know that irritation of the vascular endothelium causes plaque to grow. When the endothelium is irritated or damaged, it mounts an immune response to fix the problem. It’s this immune response that ultimately leads to plaque development. The clot can completely block an artery and cause a heart attack or stroke. “Inflammation is as important, or more important, than factors like cholesterol level in the development of cardiovascular disease,” Becker adds. High blood pressure damages the arteries in another way: The increase in pressure overstretches the artery walls, leading to small tears that scar over with plaque. Even systemic inflammation caused by stress, lack of sleep, inflammatory disease, or obesity affects the arterial lining. High blood sugar and high triglyceride levels also contribute to inflammation.3,4 Controlling these risk factors with diet and other lifestyle changes can decrease the risk of heart attack and stroke. Diet can be a powerful tool in protecting the lining of the arteries from damage. The ideal diet for healthy arteries minimizes harmful factors such as high LDL cholesterol and elevated blood sugar, blood pressure, and triglycerides, and maximizes factors that increase HDL cholesterol, support vasodilation and arterial elasticity, discourage clotting, and reduce oxidative stress to keep the vascular endothelium healthy. Plenty of information is available on what not to eat, as saturated fat, trans fat, cholesterol, sodium, and added sugars clearly are associated with clogged arteries. • Fiber-rich foods (eg, whole grains, fruits, vegetables, legumes, nuts, seeds) are high in many of the beneficial components listed above, but fiber itself can help lower LDL cholesterol levels, support weight-loss efforts, and control blood sugar. While the media and food companies tend to focus on individual components of food, “there tends to be too much focus on single nutrients. We need to get away from trying to assign an effect to an individual food or nutrient and think in terms of dietary patterns,” she adds. And the benefits of a healthful dietary pattern go beyond a single nutrient. “Sure, a fiber-rich diet may have some impact on lowering LDL cholesterol levels, but you also get other benefits when you eat fiber-rich foods like fruits, vegetables, legumes, nuts, and whole grains such as essential nutrients and healthful fats,” Lichtenstein notes. Since her patients already have heart disease, Morris recommends chicken, turkey, and fish almost exclusively, eliminating or at least cutting back on egg yolks and focusing on the quantity and type of fat in the diet, emphasizing mono- and polyunsaturated fats in place of saturated fat. “I also strongly recommend eating beans. They’re like a magic food: high in fiber, filling, and they help stabilize blood sugar,” she adds. Alissa Rumsey, RD, CDN, CNSC, CSCS, a dietitian, personal trainer, and spokesperson for the Academy of Nutrition and Dietetics, recommends a similar dietary pattern with more mono- and polyunsaturated fats from foods such as olive oil and avocados, nuts, seeds, omega-3 fats from fish, and plenty of fruits and veggies. “All the food components that help keep arteries healthy are in these foods,” she says. However, just following a healthful dietary pattern isn’t the whole answer. “You have to look at this in the context of energy balance,” Lichtenstein cautions. “You can eat the best heart-healthy, nutrient-rich diet, but if you take in an excess of energy, you’re not likely to see the benefit.” Obesity goes hand in hand with artery-damaging conditions such as high blood pressure, high cholesterol, and diabetes, and it’s associated with a general rise in inflammation. To encourage moderation, Morris suggests decreasing fat intake and talks to her clients about portion control using food models to demonstrate appropriate portion sizes. Insulin resistance makes losing weight difficult, so Morris advocates patience. “Clients with fasting blood glucose over 100 may not lose weight right away, but I reassure them that if they stick with it, the weight will start to come off. It helps them to know I’ve seen it work,” she says. Nonetheless, achieving optimal arterial health requires more than just eating healthfully and managing weight. 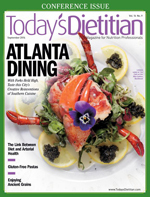 “It’s important for dietitians to help clients make other lifestyle changes,” Rumsey says. Quitting smoking, getting enough sleep, reducing stress, and increasing physical activity are all essential to maintaining healthy arteries. Healthy arteries are key to preventing heart attack and stroke. Limiting irritation of the arterial lining reduces plaque buildup, keeping arteries open and flexible. A healthful dietary pattern can have a big impact on reducing inflammation. Following a diet rich in fruits, vegetables, whole grains, low-fat dairy products, poultry, fish, and nuts with limited red meat and foods and beverages high in sugar ensures an intake of several inflammation-fighting nutrients and minimizes plaque-promoting factors such as saturated fat. Other lifestyle changes go hand in hand with diet to keep inflammation in check. According to Becker, a healthful lifestyle does prevent CVD. “Less than 3% of Americans eat a good diet, exercise regularly, are not overweight, and don’t smoke,” he says. “But these people have a very low risk of heart attack and stroke.” Dietitians can help more people make the lifestyle changes necessary to keep their arteries healthy for a lifetime. — Judith C. Thalheimer, RD, LDN, is a freelance nutrition writer, a community educator, and the principal of JTRD Nutrition Education Services. 1. Watson E. Heart healthy foods, the next generation: ‘It’s not just about cholesterol anymore ... it’s about healthy arteries.’ Foodnavigator-usa.com website. http://www.foodnavigator-usa.com/Markets/Heart-healthy-foods-the-next-generation-It-s-not-just-about-cholesterol-anymore-it-s-about-healthy-arteries. March 22, 2013. Accessed June 25, 2014. 2. Brown AA, Hu FB. Dietary modulation of endothelial function: implications for cardiovascular disease. Am J Clin Nutr. 2001;73(4):673-686. 3. Caswell J. When risk factors unite. Stroke Connection. http://www.strokeassociation.org/idc/groups/stroke-public/@wcm/@hcm/@sta/documents/downloadable/ucm_310308.pdf. Published January/February 2005. 4. Atherosclerosis and stroke. American Heart Association website. http://www.strokeassociation.org/STROKEORG/LifeAfterStroke/HealthyLivingAfterStroke/UnderstandingRiskyConditions/Atherosclerosis-and-Stroke_UCM_310426_Article.jsp. Last updated April 2014. Accessed June 30, 2014. 5. Know your fats. American Heart Association website. http://www.heart.org/HEARTORG/Conditions/Cholesterol/PreventionTreatmentofHighCholesterol/Know-Your-Fats_UCM_305628_Article.jsp. Last reviewed April 21, 2014. Accessed July 11, 2014. 6. Foods highest in total omega-3 fatty acids in vegetables and vegetable products. SELF NutritionData website. http://nutritiondata.self.com/foods-011140000000000000000-1.html? Accessed July 1, 2014. 7. McCulloch M. What to eat for arterial health. Environmental Nutrition. http://www.environmentalnutrition.com/issues/37_5/features/eat-for-arterial-health_152611-1.html. May 2014. 8. Sainani GS. Role of diet, exercise and drugs in modulation of endothelial cell dysfunction. J Assoc Physicians India. 2012;60:14-19. 9. Telis G. You probably know less about cholesterol than you think you do. Here’s some help. The Washington Post. http://www.washingtonpost.com/national/health-science/you-probably-know-less-about-cholesterol-than-you-think-you-do-heres-some-help/2014/06/16/d9fa9350-e4fa-11e3-8f90-73e071f3d637_story.html. June 16, 2014. 10. Homocysteine, folic acid and cardiovascular disease. American Heart Association website. http://www.heart.org/HEARTORG/GettingHealthy/NutritionCenter/Homocysteine-Folic-Acid-and-Cardiovascular-Disease_UCM_305997_Article.jsp. Updated March 18, 2014. Accessed July 6, 2014. 11. Jahangir E, Vita JA, Handy D, et al. The effect of L-arginine and creatine on vascular function and homocysteine metabolism. Vasc Med. 2009;14(3):239-248. 12. Eckel RH, Jakicic JM, Ard JD, et al. 2013 AHA/ACC guideline on lifestyle management to reduce cardiovascular risk: a report of the American College of Cardiology/American Heart Association task force on practice guidelines. J Am Coll Cardiol. 2014;63(25):2961-2984.